Many people think going to the dentist for regular checkups is just about keeping your mouth clean and maintaining a bright smile. In a lot of cases, your dentist is the first line of defense when it comes to early diagnosis of dental issues as well as other health problems. According to research, over 90 percent of all diseases have oral manifestation, which means regular dental visits are not limited to oral hygiene, so you should schedule a visit to the dentist even if you don’t currently have a dental issue. If you are visiting a dentist for the first time, make sure you tell them about any dental issues you are having and also provide them with your complete medical history. When they have all the necessary information on hand, your dentist will be on the lookout for symptoms of serious dental issues as well as other health risks. A routine dental checkup will help your dentist know if you have cavities, which are decayed areas of your teeth. Cavities can be treated by your dentist drilling away the decayed part of your teeth and replacing it with filling made of either porcelain, composite resin or metal. If you suffer from gum disease or bleeding gums, it could be caused by plaque buildup inflaming your gums. It could also be caused by diabetes. If you have bleeding gums but you have not been diagnosed with diabetes, your dentist will likely be the first person to notice the symptoms during a routine checkup and will tell you to go see a doctor to confirm the diagnosis. Another dental issue your dentist can diagnose early is oral cancer. If you are having difficulty swallowing, numbness in your tongue or experiencing pain in your jaw, you should schedule an appointment if the symptoms persist for over a week. 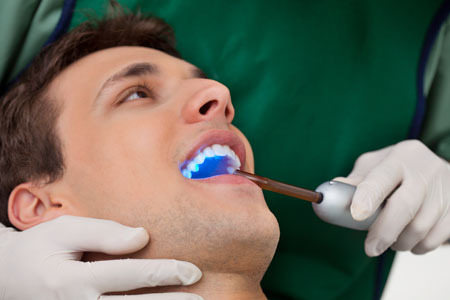 Your dentist will check your face, lips and mouth for any signs of oral cancer. Even if you don’t exhibit the symptoms, many dentists perform the test during routine checkups as a preventive measure. If the test performed by your dentist confirms that you have oral cancer, you will be able to start treatments before it spreads, giving you a better chance of beating the disease because it was caught early. Tobacco use increases your chances of having cavities, gum disease and oral cancer, which is why dentists and doctors recommend not smoking. If you are a smoker and want to quit, ask your dentist for recommendations on how to kick the habit. Routine visits to the dentist can also help detect early signs of heart disease. Studies have shown that people with periodontal disease are more likely to have cardiovascular diseases, including stroke and heart disease. Dentists usually help you maintain good oral hygiene, but they can also spot signs of other diseases which can help you start treatment early and prevent them from getting more serious. Make sure you schedule regular appointments with your dentist to deal with your dental issues and also catch potential problems. How Often Do I Really Need to See My Dentist? « How Does Teeth Whitening Work?